Its that time of year again when our guild is gets ready for one of our big fundraisers. Our town has a few large Craft Sale every year in November and we make sure to get a table at a few to sell tickets on Christmas quilts. 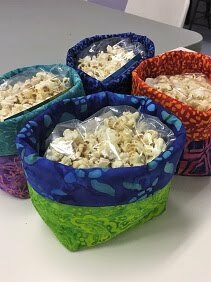 We do a One Day Raffle at each venue and that really gets tickets sales flying as everyone is excited to try to win the quilt that is being drawn that day. This year we made two Perfect Ten quilts using the Home for the Holidays fabric collection by Riley Blake. I quilted this first on with the Bora Bora pantograph and used green So Fine thread to match the lime green backing I dyed to match! Hope the guild members like my bold choice, I thought it was fun! But those that are not so keen on Lime Green will be happy to hear that I went with a more subdued backing on the second quilt. Here is the second quilt, made using the same fabric line but a different selection of fabrics. We had a fat quarter bundle and divided it in half to get the two quilts. I used the Bubbles pantograph on this one, with white So Fine thread and a solid white backing. The batting in both quilts is Hobbs 80/20. I thought it would be interesting to look back at all the Christmas Raffle quilts Iquilted for the guild. 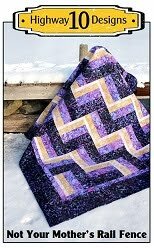 The first one was in 2010 and it was a beautiful Irish Chain quilt. In 2011 we made another Perfect Ten quilt using Snowman fabrics. 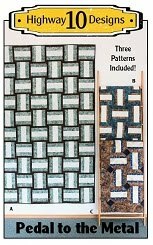 In 2012 we made the Cobblestone pattern using Christmas fabric with a black background. 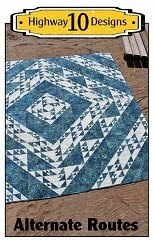 In 2013 we made a more modern Triangle quilt using the Jingle fabric collection. In 2014 we made two different quilt to have at two different Craft Sales. The first one was the Bali Sea Star using a Christmas fabric collection. The second one was the Good Tiding pattern using the Solstice fabric collection. This one has been my personal favourite out of all of them. I was cleaning out my sewing area the other day and pulled out some stars I made a few months ago using a set of rulers called Tri Recs. I had made 12 twelve inch star blocks from bright batiks that I had in my stash and decided to sash them with 2” finished squares. I then added a 5” finished white border of the same background fabric that is in the stars. No pattern, I was just playing. I loaded it on my longarm yesterday with a quilting plan in mind and got it finished this morning. I haven’t touched my longarm in over a month and a half so it was good to feel motivated to quilt again. Yes I made another quilt I do not need and it feels good! I sketched out a quilting plan for the blocks and I knew I wanted a circle to be a secondary design element in the blocks. I was inspired by a quilt I saw on Esther’s blog awhile ago here. I used a 15” arc ruler to make the circle and the rest was free hand. I used white So Fine thread in all the white fabric and Mono-Poly on the bright batiks. 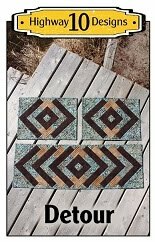 I CC’s the squares and the stars and did a feather swirl in the outer border. The batting is Quilters Dream Blend. I used a solid white backing to show off the quilting and used white Bottom Line thread in the bobbin. Now I have to decided on a binding, I want it to be colourful and maybe even piece it with scraps of fabric used in the quilt. I feel like I’m slowly getting my quilting groove back. I have a few guild quilts I might put on the machine next. I have finally been tackling my “to do” list and had some business cards printed up. Vista Prints was having a 50% off sale so that swayed me to order from them but they are a very smart company and know how to tempt you to buy more! You’ve been warned! I know I’m a sucker and I couldn’t resist getting a few mugs with my logo on them too. The next thing on my “to do” list was to paint my Shack. Over the last couple of years the cold winters really took a toll on the drywall and some of the plaster has cracked in the corners so Tim patched those up and I picked a new paint colour. It has been a peachy beige and I thought a blue/grey would be a nice change. All done! The blue really highlights my Island Sunrise quilt on the wall and gives the room a brighter feel. I did a fun project with my son the other day and thought I would share it with you too. My son loves Lego and found a YouTube video on how to make Lego Gummy Candies so we gave it a try. To see the video click these orange words! We had the Mini-figure moulds already and they turned out really good. We are making another batch today! Oh and that pretty plate they are on was a gift from my friend Kirsten who is an amazing Fused Glass artist. She let me play in her studio this summer and I made a few items! Can’t share those as they will be gifts but was that ever a lot of fun!! I keep telling my self “ I don’t need a new hobby, I don’t need a new hobby, I don’t need a new hobby”. So this summer I found myself wondering why I wasn’t spending much time at my sewing machine. Why is my drive to make quilts so low right now. I always have a quilt project on the go and can’t wait to finished it. I’m one of those rare ‘start to finish’ quilters that doesn’t have a ton of UFO’s but what I do have is a lot of finished quilts! I have more than anyone would ever need! So I was curious to see how many quilts I have around the house and I’m just talking bed quilts not wall hangings. So I went room to room, checked all the closets and Rubbermaid boxes, found all the living-room cuddle quilts as well as the ones on my display ladder and this is what I found. In total 40 bed sized quilts in my house, and that doesn’t include the baby quilts I made my boys which is what got me started in the first place! A lot have been used and love and about 10 are new and have been sitting in a closet waiting to find the right home. I sent one quilt home with my sister this week as I prefer to gift them then sell them but I think that might have to change. I have some really nice quilts that I loved making but really I do not need them! Why is it so easy to give them away but not sell? I have gifted many quilts and even donated a few to charities so I might do more of that. How many quilts do you have in your house! Is this normal? I have even more quilts scatters at different quilt shops on display and some with a few sale tags so I am trying to control this issue! So maybe that is why I don’t have the drive to make more right now, I have too many. 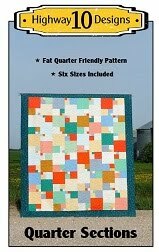 Any other Quiltaholics out there? How many quilts are in your house? I don’t usually go this long without posting on my blog so thought I better check in to say that even thought there is not much quilting going on, I’m having a really nice summer. I haven’t touched my longarm in a month and have only sat down at my sewing machine a few times so nothing to show that is quilting related. I have been distracted by the lake with kayaking, boating, swimming and walking in the bush. My sister is visiting right now and we took her on a short drive out to Snow Lake which is about 180km from our place. It was a cloudy day and only 20’c so a good day to walk in the bush. We found a few trails to walk that I had never walked before. But first we stopped at the local dump to drop off garbage and say Hi to the resident bear, then off to Snow Lake for the day. First stop as Wekusko Falls where we walked the trails and across the two bridges on the Grass River. We watched as snorkelers were swimming in the lake, you can see two of them in the lake pictures below. We asked them what they were doing and they said watching the fish swim below and some were spear fishing for Pickerel too. As we drove from Wekusko to Iskwasum we saw a few Sandhill Cranes, there were two adults and two young ones. It was hard to get a pictures as they were walking so fast to get away from us! Can you see the young one in the first picture? He blends in so well. When we got to Iskwasum we walked the Karst Spring trail. It was a very rough trail with lots of rocks and tree roots so you had to be care and watch were you were stepping. It as all worth it as once to we got to the Karst Springs it was a beautiful spot. Here is were the spring water emerges from under the Limestone formation. In 2009, a forest fire that came though this area so part of the trail goes though a burn. It was nice to see so many new plants growing, especially all the raspberries! I was slowing everyone down in this area as I kept sampling the berries!